Basilica of Our Lady of Dolours, natively called Puthan Pally (new church), is a minor basilica of the Syro-Malabar Catholic Church in Thrissur, Kerala. 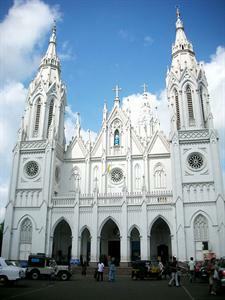 Apart from being the tallest church in Asia, its Gothic style architecture is also very famous. There are fine murals, portraits of saints and scenes from the Bible placed in the interiors. It was in 1814, the parish and original church building were founded. It was first Catholic church in Thrissur. It was also a center for the local St. Thomas Christians (now Syro-Malabar Catholics) then. In 1874, Elias Mellus, the Chaldean Catholic bishop reached India. A group of Christians accepted him as their bishop. That group got separated from the Catholic line, founding the Chaldean Syrian Church. This led the Syro-Malabar Catholics to construct a new church in response. They built a temporary church in the school ground there. On 10 October,1925, His Ex. Bishop Vazhappilly Mar Francis named the new Church as the church of Lady of Dolours and St. Theresa of Infant Jesus was declared as the Co-patroness. As the church was not enough roomy, the believers wanted to build a larger church. And the present church was decided to be built on the plan that Mar Francis Vazhappally drew after a European trip in which he observed the architecture of churches there. On 21 st December, 1929, the foundation of the new church was laid by him. The construction was almost completed in 11 years. It was supervised by the famous Engineer Jnanaprakasam and the superintendent Ambros. In 1935, Sri. Ramavarma Thampuran, the erstwhile King of Cochin, visited it and offered all the teak wood needed for the church. On 24 November 1940, Mar Francis Vazhappilly consecrated the Church. As a part of the celebration of the centenary of the Thrissur diocese, a Perpetual Adoration Center in the Church was inaugurated . 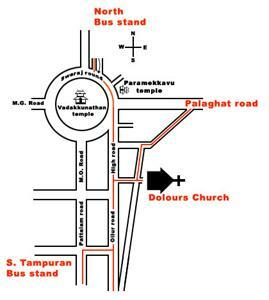 On 25 April 1992, His Holiness, Pope John Paul II elevated the church of Our Lady of Dolours to a 'Minor Basilica'. The consecration was carried out on 20 May 1992 by His Eminence Cardinal Antony Padiyara. Then onwards, the Church was to be called 'Basilica of Our Lady of Dolours. Apart from being just a pilgrim center, the church ir also a tourist attraction. Thousands of people visit it every day. It has two colossal belfries which are built in gothic style. The church has the length of 370 feet in east-west side and 180 feet width in north-south side. The total plinth area of the church measures 25,000 sq ft. A mural painting of the Holy Trinity can be seen on the ceiling. There are a number of rock pillars covered in mosaic on both sides of the nave. The floor is also paved with mosaic bricks and the beautiful electric lamps enlighten the church. The main altar of the church is about 100 feet high. Other 10 altars are spread adjacent to the main one. In the center of the main altar, stands the statue of Our Lady of Dolours and on sides of this statue, are placed two beautiful statues of Holy angels Raphael and Michael. Just below it, there are the twelve apostles of Christ. A dome is placed above the main altar, inside of which there are paintings of Mother of dolours and her seven Dolours. There are the pictures of the four Gospel writers in the corners of the dome. There is also an Episcopal throne (a carved sculpture) intsalled in the front right corner. Pope John Paul II had seated on this on his Thrissur visit. A beautifully carved lectern has been placed in the front left corner of the main altar. It is kept as a souvenir of the Pope's visit. On the right side of the main altar, there is a beautiful portrayal depicting the miracle of Jesus feeding 5000 people and five loaves and two fishes. The picture of Holy Mary's assumption is on other side. The ten altars on both sides of the main altar are consecrated with the statues of St. Francis Xavier, Little flower, St Thomas, Christ the King, The Holy Family, St. George, St. Joseph, St. Antony, St. Sebastian and St. Maria Gorethy. The statues of the Mother of Rosary are also there in the altar. Apart from those 11 altar, there are two more altars under the bell towers on both sides of the entrance of the Church, which are devoted to St. Francis Assisi and St. Vincent De Paul. That makes the total no of altars 15. The back side of the Church has a tower named Bible Tower opened in 2007. It has a height of 260 feet what makes the church the tallest in Asia. The main feast of the church is on last sunday of November. The feast is the biggest festivals of catholics in Thrissur and the second biggest festival after Thrissur Pooram.